This wine has a cheery label. I love daisies, they’re so positive and don’t seem much to care whether the people who want to have a nice green lawn don’t want them there, they’ll pop up anyway and spread some joy. This wine isn’t made from daisies, fairly obviously, although dandelion wine is a thing so maybe you can make daisy wine. It might be poisonous though, so don’t try that at home folks. Also you’d have to kill thousands of daisies to make it and that would be a shame. So, wine made from grapes, Merlot grapes, not daisies. Glad we cleared that up. 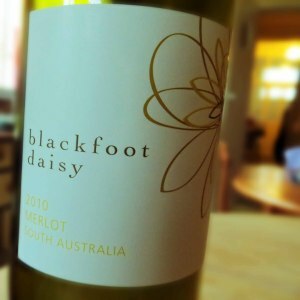 This Blackfoot Daisy Merlot ’10 from Virgin Wines is a deep ruby colour. It smells fruity, with a little herbiness. It’s dry, without a great deal of acid. The tannins are soft and ripe. It has a medium light body and an alcohol level at the upper end of medium. It tasted like plums and damsons, rather like you’d expect an Australian Merlot to. That herb flavour is still just there, bordering on mint but never fully committing to it. It was a little ordinary, a bit like a daisy really, but as I’ve explained, ordinary isn’t necessarily a bad thing. Overall this is a good wine for a party a summer barbecue or everyday merriment, it’s easy drinking and isn’t going to offend anyone. I wouldn’t pay the full advertised list price of £8.99 for this, but don’t worry, I got it in a bargain bucket case with £40 off, and I’m sure you can too. Virgin Wines often offer super coupons of various sorts that make their actual prices more realistic than the headline ones.